The word “humanity” means, “God Being Man,” hu (God), man, ity (being). The purpose in us being here is to remember and know this truth. Not knowing and remembering that we are God experiencing itself has caused us great suffering in the past and still in the present. We have given our power away to others and allowed them to control and separate us from our cosmic reality. Now, as we approach the creation of a final Golden Age, the time has come for MAN POWER to become GOD POWER. Are you ready? All previous Golden Ages, (Lemuria, Atlantis, Mayan, Aztec, early Egypt, Greece, etc.) were created and supported by their connection to higher realms. These all fell as a result of their disconnection from whence they came. We are being given an opportunity to create a permanent Golden Age where we never lose our connection from our creators. They are here to guide, love and support us into eternity. The purpose of this book is to reveal as much truth as possible and inspire you to new heights allowing this new truth to finally set us free. It appears humanity is ready in our consciousness to enhance the reality of truth rather than the illusion of non-truth. We no longer have to give our power way to a god to take care of us. As God we can take responsibility for ourselves, as we continue to receive and accept wisdom’s beyond the human mind…we simply cannot be/do it alone any more….we never could. The teachings and messages in MAN POWER, GOD POWER are intended to assist us in our personal and collective processes of ascension, moving into a higher frequency of existence. 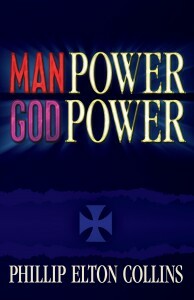 In this book you can see yourself as your role as God (power). By being God you are God’s messenger. God gets to experience you in the beingness of you. Please know if you resonate with what is being said here you will receive an energetic download. Many throughout the world are receiving these wisdoms. I salute you and humbly ask that I join all those who have preceded me, as you continue to inspire me and others. What is contained throughout these pages is a collection of higher realm wisdoms I and others have received and I am called upon to share, to balance giving and receiving. Again, I am one of many sharing and receiving such communications. There is nothing special about my or others receiving these, we are simply showing the way for others who soon will be doing the same. We are all moving into telepathic equality, harmony and balance. If it resonates, randomly go through these teachings and allow your resonance and discernment to select the message/teachings for you in that divine moment of now. For those who decide to read all that is here, you will have the glorious gift that affected me greatly. We are all teaching what we need to learn. Welcome to the creation of a new you and world of We Consciousness and wonder. You are here to transform from Man Power to God Power which has always been inside of you. This will be done through the mastery of self; to be able to love you, others, your planet and the entire cosmos. This is actually the activation of your divine soul plan! GOD POWER IS EVER PRESENT, ALL POWER, ALL LIFE, TRUTH AND LOVE OVER ALL AND ALL. “You are always in communication with God, because you are God and God is you,” Archangel Gabriel.